And this week we've got a beauty for our Burger of the Week. We didn't roll it out last week, because it was a short week, and this baby needs a full week of adoring consumption. For your dining pleasure, may we introduce The Moroccan Merguez Burger. A beautiful patty of spicy Moroccan merguez served with a Harissa Goat Cheese Yogurt & Roasted Red Pepper Relish on your choice of Balthazar bun. My my my. I'm taking bets that those that have one, will be back for another before the week is out. The weather is telling us its Soup Time. Not to brag, but we make some really really good soups. We'll be rolling these out midweek or so. The lovely Lena, she of the fabulous home made desserts, has been convinced to make her absolutely Insane Brownies. We are most excited about this development. Just to remind you we're also doing delivery. Its a relatively small area to start, but we're hoping to expand it once we feel confident that you're getting your vittles nice and warm and you're not waiting for them for a long time. Our delivery area is bordered to the North by Hubert Street, to the South by Park Place, to the East by Church Street, and to the West by the West Side Highway. 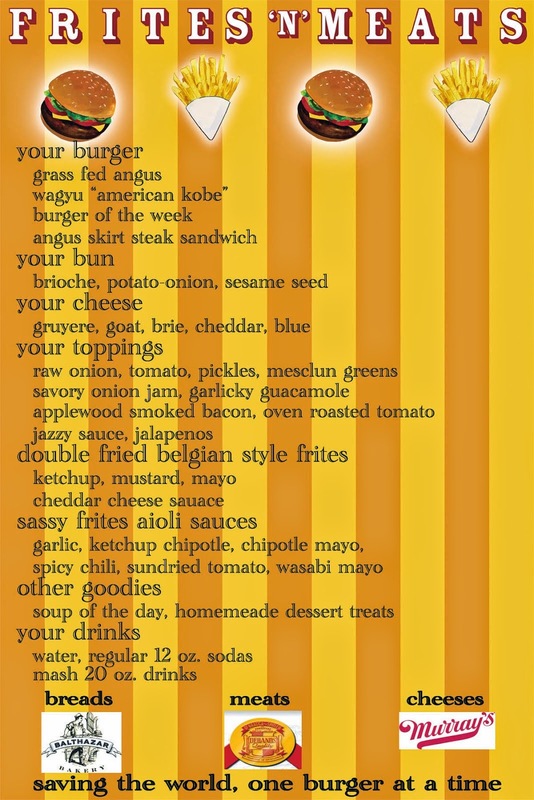 Just give us a shout at 917.292.9226 and you'll be chomping on a killer burger and some tasty frites in no time flat. As we start our fourth week, we have much for which to be thankful and much to look forward to. We are extremely grateful for your support, your return visits, and your growing acceptance of us. These last few weeks have really shown us that if we constantly try to provide a high quality product, and that you see the effort we put into it, you will, as you have shown, give us every opportunity to succeed. After our first couple of days, when we were swamped and definitely not ready, and many of you got handed the wrong order or burgers that were over- or under-cooked, you could have easily written us off. But you didn't. You stuck with us. And now seeing many of you coming back time and time again, we know we must be doing something right. Perhaps we're not 100% there yet, we certainly think we can improve, but we're getting better and closer to the level we want to achieve. Well this week, tomorrow in fact, we will be starting to do delivery. Initially to a small area, but as we become more confident in our ability to deliver to you a piping hot burger in an acceptable amount of time, that area will increase. Our foremost concern is that nothing we do affect the quality of our product. Initially you will have to call in your orders, but in the not too distant future, you will be able to place your order over our website or possibly through seamless web...we hope. Of course there are the Burgers of the Week to look forward to, and starting next week, we will also have soups, and hot drinks to warm you in the Winter chill. Thank you all for helping us Save the World One Burger at a Time. Sitting here on the cusp of Friday. Pretty exciting week, gotta say. We're seeing more and more of you return, which is absolutely wonderful and extremely flattering. We really love that the Stuy folks have made us a regular stop on their Lunch tour and have been covered in the Stuyvesant Spectator. And we really love that we've become a regular frites stop for the kids pouring out of PS234 after school. What's really been humbling and at the same time very affirming is seeing a steady number of people travel down to visit us because they heard about us from friends. We've had a good number of folks travel down from Chelsea, but this week we received a pick up order from Rosalie, who came down from 36th Street. Wow! We were completely blown away. Wow again. It's also been very cool to see that our dinner experiment is working out. We love the fact that not only are the folks working in the area taking a shine to us as a lunch option, but the resident Tribecans and BPC-ites, have deemed us dinner worthy as well. With the chill in the air, we figured soup would be a good thing. Stay tuned for a weekly roster of wonderful veloutes and such. And lastly, we're really psyched about this one, in addition to continuing with our Phone Ahead Pick Up Service, we're going to start doing delivery. Yep, that's right. Starting Monday we'll be doing delivery. At first in a limited radius, but as we master it and feel confident that the product that arrives to you is the quality we want it to be, we'll expand it. Initially, you'll have to call us to place your order, but in short order we'll make it web-based through our website and hopefully Seamless Web or Delivery.com. So that's about it. It's been an exhilarating, humbling, exciting, kooky ride. And we think the ride's just getting started. Stay tuned....and tell your friends. For most of us Monday is the least favorite day of the week. The start of the work week, end of the weekend. No fun. For us its a bit different. Since we ran out of food on Friday, we've been thinking about Monday. Last week, a bit nervously (after all it was only our second week), we started taking phone orders for pick up, and started staying open into the dinner hours. Wow, was the response great!!! Each day more and more of you decided no to stand out in the chill and drizzle, but to just give us a call and swing by 15 mins later to scoop up your chow. No muss, no fuss. And many of you were smiling when you saw us in the evening. We like to see you smiling after a long day. Especially if we can play a part in that. So what have we got coming up this week? Some more exciting stuff, thats what. Seasoned Ground Lamb, Goat Cheese, & Port-soaked Figs. "What?!?!?" you say, "That sounds very weird", you say. Yes, that may be true, but we guarantee you, this will be the best burger youve had in a long long time. Ok, so we came up with the Burger, but what do we call it? We originally were thinking Mediteranean Burger, but thats pretty lame. So we figured we'd let you name it. Send us an email to feedme@fritesnmeats.com, put Burger Name in the Subject and tell us what you'd call this bit of fabulousness. We want to pay homage to the Mysterious & Charismatic FM. We want to keep it with the Superhero theme gracing our truck. Person who submits the winning entry, not only gets our undying gratitude, but will also receive some super cook Frites'N'Meats gear. Lets hear it Burger fans!!! What are we gonna call this puppy? 1. We will start taking limited phone orders for pick up. Give us a call at 917.292.9226. If we dont answer, we're probably a bit busy with customers at the truck, but please leave a message and we'll call you right back. 2. A lot of folks who live in the area have been asking if we're going to stay open for dinner. Yep. Starting that today also. We will be parked until 7pm. Stop by and grab some goodness on your way home. 3. Special Burgers - There are 30 combinations to choose from just between the different breads, meats, and cheeses (never mind how many once you factor in the different toppings), but we've decided we need to have a Burger of the Week. Starting next week. The first Burger of the week will be: Mediteranean Burger - Ground Lamb, Goat Cheese, Figs Marinated in Port. We know, sounds a bit strange, but wait till you try it. It will make you cry, its so good. The first full week is done. What did you think? What did we think? We are extremely happy by how the neighborhood has responded to us. We already feel like we've been accepted as a neighborhood fixture. It's great to see not only people working in the area stopping by for lunch, but also the students from Stuyvesant H.S., BMCC, and especially all the kids from PS 234. And we must be doing something right as we are already starting to see many of you coming back. But it hasn't all been perfect. It is our first week, and no matter how much time we spent getting ready, it's not until you open up, that you see what works and what does not. We have to say, our first day, October 29th, was not good. Not good at all. If any who are reading now, visited us on that first day, we apologize. We were not ready to have 40 people waiting for us to open on that first day. We know we made mistakes. We know many of you were not happy with what you got and we profusely apologize for that. We learned a lot this past week and know we will continue to learn over the next several weeks. We hope that you will see and appreciate what we are trying to do and stick with us as we work towards providing the best burger and fries. Not only from a truck, but anywhere in NYC. We really feel that we are capable of that, and will achieve that in a short period of time. We also love the suggestions and feedback we've been getting and you will soon see some of the things you've said to us integrated into Frites'N'Meats. So what will you see? We will definitely be introducing daily Burger specials featuring meats other than Angus & Wagyu. We will also be kicking it up on the Frites end. But most importantly, we want to hear from you. Really. Tell us what you think of what we're doing. Love us or not, any feedback from you will only help us get better. We want to know. Have a great week. We hope you'll visit us.